Millions of people listen to YouTube channels on the Internet. So in a very real way, we have a variety of Internet journalists who affect the mass consciousness of those who listen to them on a daily basis, just like millions of Americans listen to the nightly news through ABC, NBC, CBS, CNN, and Fox. These two views of reality—independent Internet commentators and mainstream journalism—are diametrically opposite each other in many ways. A recent example of these two extreme views was around the landing of the Mars explorer. I watched the corporate television news coverage, and when the explorer landed successfully on barren, uninhabited Mars, at least a hundred people at NASA’s flight control center in Houston, Texas stood up and congratulated one another with hugs, the shaking of hands, kisses, and high-fives for this accomplishment of a United States probe soft-landing on Mars. At the same time, some Internet journalists and conspiracy theorists are claiming that millions of people have been taken to the moon, Mars, and other planets, where we have colonies. They claim that there are people being born in these colonies who have never seen the earth and that we have had this advanced technology to colonize other worlds since the 1950s. Some also claim that extraterrestrial communication has existed even longer, like with the Nazis prior to World War II. Many of these same YouTube/Internet journaIists delve into metaphysical and paranormal events and have many other so-called nondisclosure stories. They supposedly get information from insiders who divulge these secrets to these specially chosen independent journalists. Another example of a conspiracy story is that the Paradise, California fire was actually caused by the bad cabal, to kill off the 500 to 1,500 extraterrestrials who lived among the humans there—extraterrestrials who only had slight differences from the earthly humans, like all ETs having white hair and different teeth, so they wore wigs and dentures when in public. And these so-called journalists state these things with such authority! These Hollyweed stars, who use sensationalism and claim to be knowledgeable in metaphysics, also say there are more than 3,000 types of extraterrestrial species on earth, most of them benevolent but some very evil, like the lizard people, who are over seven feet tall and have huge dragon-like heads. The artists’ renditions are very scary. Then of course you have all heard, I am sure, about the Greys and the slanted-eye green beings, and the Dracos, and the list goes on. Of course the good guys are called the Avians. I don’t know if they got that from Evian water. What I discern from my research of all these teachers of metaphysical and paranormal sensationalism is that their stories have some truth with a lot of falsehood. And most of the stories are very frightening and fearful. As a matter of fact, if you listen to them too much, you are afraid to go out any time—day or night—for fear of being abducted or cloned. These story tellers found the secret of making money, as did Art Bell on his show in the 1970s, George Noory after him, and many others, who I will not mention because I do not want to give any of them free press. Today people will pay thousands of dollars to attend a seminar to hear a lot of this nonsense—not that I, as a URANTIA Book reader and teacher, do not believe in inhabited worlds, for I do. The URANTIA Book, which is a much higher source to learn the cosmology of the grand universe, teaches there are trillions of inhabited worlds in a very big grand universe. The URANTIA Book gives ancient history of our planet and teaches that 200,000 years ago, when the Lucifer Rebellion occurred, Michael of Nebadon (now known to many as “Christ Michael”), the Creator Son of our universe, cut off the circuits of interplanetary communication and travel to Urantia/Earth, so that communication with and visitation from extraterrestrials (referring to evolutionary mortals from other worlds) was no longer allowed. Starting 500,000 years ago during the era of Caligastia, who was the fallen Planetary Prince mentioned in The URANTIA Book, for 300,000 years (before the Lucifer Rebellion), there were huge vessels that came to the planet, but because of the Rebellion 200,000 years ago, they could not take off again due to the cut-off circuitry. Some of those ships have been found in northeast Africa as well as ancient Persia. On some occasions in the contemporary era, certain vessels have crash-landed on our planet, but I will not give the names of the locations. It is better off if you do not know, because certain people have taken the names and “ran with them”, resulting in YouTube/Internet journalists inventing every type of scary phenomenon you can think of coming from those crash sites. In the New Testament of the Bible, Matthew 24 refers to prophecies that Jesus gave 2,000 years ago about “signs in the heavens” prior to His return to Earth, with some of those signs interpreted today as possibly being UFOs. There indeed are many signs in this modern era—in the heavens as well as on earth. From time to time throughout the history of the planet, there have been sightings of strange and unidentified things in the skies, as written in the Book of Enoch and other writings and oral tellings from various traditions and cultures, which have been passed on. There are also contemporary authors who have written sensationalized books, supposedly speaking of ancient mysteries from the Sumerians, like Zecharia Sitchin’s book about Nibiru and the Anunnaki. I have several videos out that would be good for you who read this article to view, because there are many things happening in the heavens and on the earth that we need to be aware of. I believe we are in the tribulation period mentioned by Jesus in Matthew 24 and Luke 21 and more so in The Cosmic Family volumes (which is the continuation of The URANTIA Book), giving information of what will happen during the time of tribulation concerning the earth changes as well as after The Promised One returns, which will be the Divine New Order of things. Nibiru, Planet 7X, The Destroyer, Wormwood — The Adjudicator is Coming: Time for the Spiritualution! It truly is confusing in these days of mass information. The Book of Isaiah in the Old Testament of the Bible refers to the era of knowledge, which I believe to be now, for there is more knowledge available on the earth today than ever before. Not only has knowledge increased, but so have avenues of communication. Today someone in Siberia, with a computer, can become a teacher and have a YouTube channel and proclaim himself to be channeling messages from the Pleiades. Many of these teachers claim to have been abducted, hit by a beam of light, hit by an electric bolt, or suffered a head trauma and afterwards had psychic abilities. Some even claim that they were once an apostle of Christ, and on and on. Jesus did indicate that prior to His return on the earth, in the last era before His coming, the apostles would be back on the earth. But you know there were only twelve, and there are thousands of them out there claiming to be one of the twelve apostles. Do the math. I once met a female world-renowned astrologer, who claimed that she was having an affair with an extraterrestrial space commander by the name of Ashtar, secretly at night of course. And she was afraid she would get pregnant! I thought that was kind of strange, since she was in her sixties. You would think that Ashtar would pick a younger woman. But then I read that many women say the same things about having affairs with their space lovers, and of course actually getting pregnant and having a half-human, half-ET child, which have become known in the New Age community as hybrids. Now of course there is a truth to humans that are hybrids. Some humans actually have their point of origin from another universe; not everyone on Urantia/Earth is a new soul. This is mentioned in much more detail in The Cosmic Family volumes as well as at a very beginning level in Volumes One and Two of The Sherman Diaries, compiled and edited by Saskia Praamsma and Matthew Block. And of course there was a book in the 1990s called The Starseed Transmissions by Ken Carey as well as other books touching upon the subject. 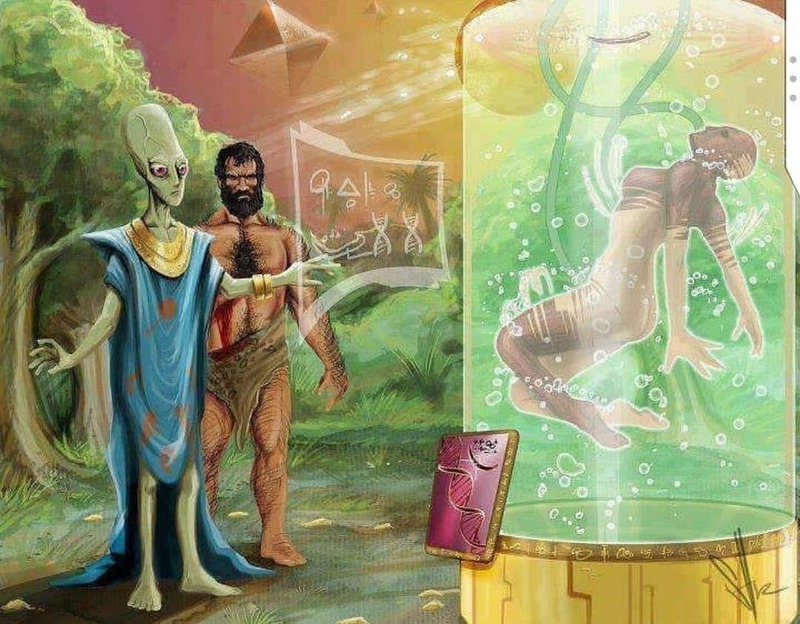 Throughout history among many peoples, at a primitive level, the understanding of some persons on earth coming from other worlds has been present. However, most of the seven billion people on this planet are new souls, never having existed before. But there are exceptions of the more than seven-hundred-million starseed, whose souls did not start on this world with their earth parents but with other parents on other worlds. Nancy Red Star has written many books on starseed, one of which is Star Ancestors. Now I certainly do not want to confuse you, but that is the whole problem. For every beautiful truth that is a real true-true, there is a false-false, as promulgated by the fallen forces unseen on this planet. This is what a fallen world is, a world of total confusion. This is why scientists choose not to delve into the spiritual and metaphysical world. But we attempt it here at The University of Ascension Science and The Physics of Rebellion, to fuse science and spirituality, and to try to show what happens when one makes wrong choices, rebellious choices, which actually do affect the subatomic world as well as the cellular world. If you are still with me, God does want us to become searchers of truth. And Jesus said that if you knock on a door, it will be answered. But we certainly do have to be very careful what doors we knock on. It is pretty simple really. Two thousand years ago Jesus Christ came to the earth. He was born in a manger with animals. He was such a beautiful and truthful man that those in error, sin, and iniquity crucified Him. He was tortured, nailed on a cross, died, and was resurrected three days later. And, according to The URANTIA Book, the resurrected Jesus remained on earth and taught for about six weeks. During that time, more than 500 people saw Him in His resurrected morontia body, before He ascended back to His capital world (called Salvington), in the universe He created (called Nebadon). The only thing scary about that story is—and it is very scary—that He was crucified by the very beings He created. To me, that is much scarier than a seven-foot tall lizard man with an ugly head. In my Anunnaki video I teach what the indigenous taught thousands of years ago, that the true Anunnaki are actually humans who decide not to walk in the way of the Creator but in their own will instead. This is a lot scarier than believing there is a race of beings called the Anunnaki from another world, who supposedly created us. Interestingly, the fallen Planetary Prince, Caligastia, was called Anu before his fall. In contemporary times, the Anunnaki of the past are called The Lost and the Demons (in fundamentalist Christianity), the Red Dogs (by more contemporary Native Americans), The Archons (by the Gnostics of Egypt), the serpent gods (in the Far east, central America, and other places), the Chitauri, the children of the serpent (by the Zulus in Africa), the snake brothers (by the Hopi of Arizona and the Zuni of New Mexico), fallen fourth-order starseed (in Continuing Fifth Epochal Revelation), and the Jinn (in the Islamic and pre-Islamic world). The Borg and the Anunnaki are the same—those who walk mechanistically as robots, following the will of these two deceivers, while thinking they are following their own will, which is the will of false liberty. They walk in the kingdom of rebellion, not in the kingdom of God. No mortal, from any world of time and space, can create life. Only God can do that. But there are many people who like to believe they are a god and that they have the powers of a god. Strange, strange, strange. The people who do not want to walk in the will of God and keep His commandments have their own views of life and creation. However, their gods are the gods of self and selfishness, and all of that is soon to be destroyed by the simple truth, when Jesus returns to this earth.